How to collect debt from a Tenant in Spartanburg or Greenville? How do I collect debt from my Tenant? Face it, it will happen. One day your Tenant stops paying rent, you will need to evict and find out that a lot of damage has been done to your property, but how do I collect debt from a Tenant once they move out? The first step is to complete a formal eviction process and have the Tenant evicted, this way you have the necessary evidence of the damages done to you and your property. You can’t hire a debt collector to go and have them collect for your damages, you first have to go through a formal process called “Summons and Complaint”. Summons and complaint is a legal action to obtain judgment for a debt. The landlord who begins the action is the Plaintiff and the Tenant who is being sued is the defendant. You as the landlord or your property manager can file a “Complaint” and an “Affidavit and itemization of accounts” with the county Magistrate court. You have to make sure that you file your complaint in the county where the Tenant resides currently! 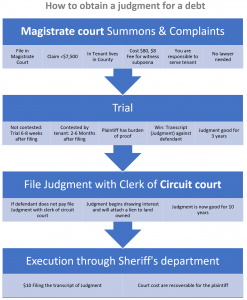 It is possible to file up to $7,500 with the Magistrate court. If it is more than $7,500 you will need to file with the Circuit court. For example the filing fee in Spartanburg county costs $80.00. For this the action is filed and the court will attempt to serve the defendant. However it is your responsibility to make sure that the Tenant is served. You can hire an attorney but that is not required! Once the Tenant is served and they do not contest the complaint the court date will be 6-8 weeks after the filing date. When the Tenant contests the complaint it will take about 2 – 6 months. At the trial the Landlord has the burden of proof. So it is important to have excellent records and receipts from the earlier eviction. If the Landlord wins the court will issue a transcript or more commonly called a judgment against the Tenant. If the Tenant will not pay the judgment the Landlord can file the Judgment with the Clerk of the Circuit Court. Also with the Magistrate Court the Judgment is only valid for 3 years, once you file with the circuit court it is valid for 10 years. When you file the Judgment with the circuit court it will start drawing interest and it becomes a lien against any land owned by the Tenant in the county. You can now proceed with an “execution” through the Sheriff’s department. At this point you can also hand it over to a debt collector. Below is a handy chart to show the different steps to follow after you evicted your Tenant. Is Your Tenant Paying Rent Late? What Do You Do in Greenville, SC? Copyright © 2019. Above Property Management, LLC.